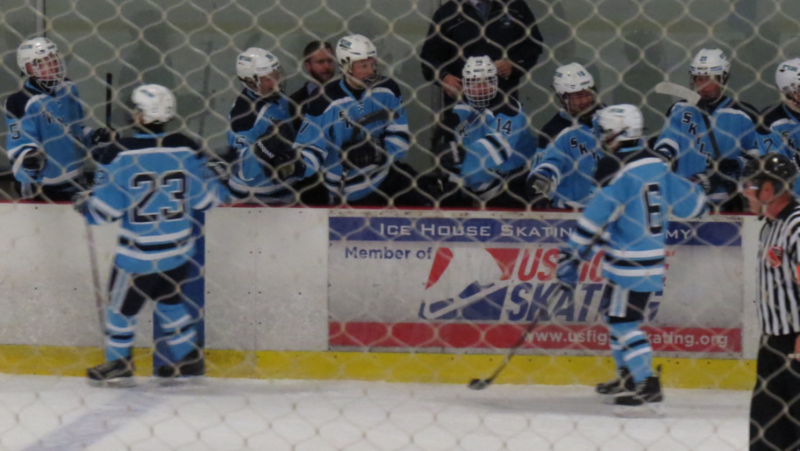 The Eagles got their year off to a great start, as they beat the Griffins from Fenton-Linden 10-2 Wednesday night at the Hartland Ice Arena. The Griffins got on the board first as they converted on an early power play opportunity as Junior defenseman Luke Lippert was serving a penalty for checking from behind. The Eagles were able to kill off the rest of the 5 minute major penalty without any more damage being done. After having several good opportunities with nothing to show for it, the Eagles finally broke the seal on the season as Junior winger Noah Bradburn buried a pass from Isaac Lippert to tie the game at 1-1. The period ended with the score knotted at 1-1. Ryan Schmunk (assisted by CJ Bahr and Luke Lippert) scored to make it 2-1. Isaac Lippert (assisted by Shea O’Brien) scored to make it 3-1. Shea O’Brien (assisted by Kotoba Nakamura) scored to make it 4-1. Isaac Lippert (assisted by Zach Roberts and Kotoba Nakamura) scored his second of the game to make it 5-1. Henry Hescheles (assisted by Like Lippert) scored to make it 6-1. Noah Bradburn (assisted by Zach Roberts and CJ Bahr) scored his second of the night to make it 7-1. The Griffins scored after the ensuing faceoff to make it 7-2. Ryan Schmunk (assisted by Sam Begosso and Ryan VanDiepen) scored his second of the night to make it 8-2. Ryan VanDiepen (assisted by Ryan Schmunk) scored to make it 9-2. Shea O’Brien (assisted by Henry Hescheles) ended the drubbing with 46 seconds left in the game to bring the final score to 10-2, giving Skyline a mercy victory. Freshman goalie Tommy Letke was between the pipes for the Eagles, and he played a spectacular game in his first appearance in a varsity game. Skyline plays The Eastside Stars from East Lansing this Saturday at 5:00 at the Arctic Coliseum in Chelsea. Come cheer your Eagles on to another victory.